We live in the digital era where memory cards are extensively used. Smartphones, digital cameras, laptops, music players, tablets, and other devices use memory cards for saving and transferring data. But did you know that not all memory cards are created the same way? Different types of memory cards have different sizes, capacities, and speed classes. Sizes and capacities you know. But classes? Let’s see what it is, along with the overall comparison of Class 4 and Class 10 cards. Let’s get to the basics first – the class rating for a memory card is the minimum write speed. Speed classes are used by manufacturers to measure SD card’s speed. So, a Class 10 and Class 4 memory card mainly differs in the minimum writing speed. Tasks Ideal for storing and transferring data, playing movies and songs. Suitable for high definition video recording. Suitable for full HD video recording. Ideal for HD still consecutive recording. Continuously shoot full HD video without lags. 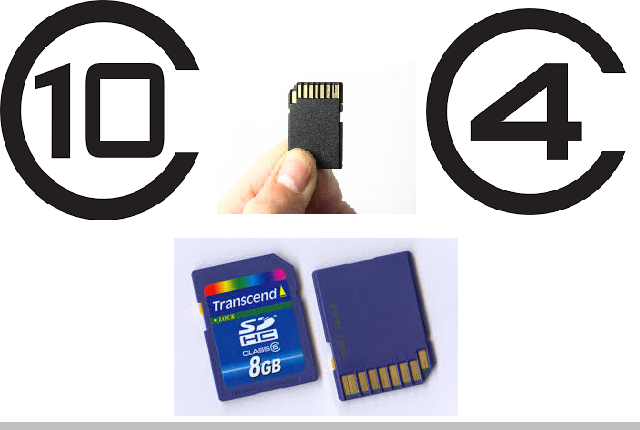 What can be concluded about Class 4 and Class 10 SD cards? By now, you would have learnt that the main difference between Class 4 and Class 10 memory cards have serial data writing speed. Although Class 4 SD card has a minimum speed of 4Mb/s, the card can actually reach a higher speed. This is because the speed mentioned is not the actual speed, but minimum speed. So, speed is just the basic guideline for differentiating between different classes. So finally, which one is best – Class 10 or Class 4 memory card? Well, that depends on how you want to use them. If you want a memory card to store and transfer files, watch videos, play music, then you can go for a Class 4 SD card. However, if you want to use it for digital cameras on a regular basis, then look for Class 10. Class 4 can be used for HD video recording, including full HD video recording. But if you are looking for continuous shooting, HD still image, and full HD video recording, then go for a higher quality like Class 10 memory card. The next factor to consider is the price. If you are on a budget, then go for Class 4. Otherwise if you are ready to shell out a few bucks, then get a Class 10 SD card. It’s better for tasks like HD video capture and burst photography. Going by stats, we can say that Class 10 has faster data transfer speeds. So if you are someone on the go, need to constantly transfer files, continuously shoot videos, and then Class 10 is for you. However, whether it is class 4 or class 10, you will have to use memory cards in a proper way. Like using Eject option while removing, check memory cards’ available memory & camera battery before start recording video or before transferring files. This is because; any interruptions during the transferring process will lead to loss of video files. If important images or HD video files are lost from your Class 10 or Class 4 memory cards, then you can recover them with Video File Recovery software. The tool retrieves videos from digital cameras, smartphones, camcorders, etc.